Long-lasting changes in neuronal excitability and synapto-dendritic cytoarchitecture require gene transcription and it is thought that synaptic activity by itself triggers signaling pathways to the nucleus that will eventually control transcriptional regulation. Signaling from the synapse to the nucleus might therefore directly control the making of proteins involved in processes broadly referred to as synaptic plasticity. At present relatively little is known about the exact role of plasticity related genes and how their expression is regulated at the cellular level. 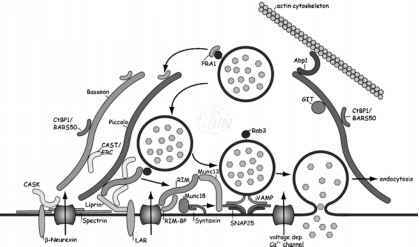 Moreover, it is largely unclear how this process affects synaptic transmission and whether there is any specific feedback between the nucleus and activated synapses that drive transcriptional regulation. These questions are of pivotal importance to understand how the wiring of the brain is brought about during development and how long-term use-dependent changes of synaptic efficacy are mediated at the molecular level.